Celebrities everywhere are going with short hair styles. This trend has been happening gradually over the last year. These short hair cuts feature long layers, side swept bangs, fringe and choppy bangs, short layers and bobs-where the hair in the back is slightly shorter than the hair in the front. If you think you want to cut your hair in one of these trendy short styles, you should first consider trying on the short style using hairstyle imaging software. This is a very important step, especially if you have never had short hair before. 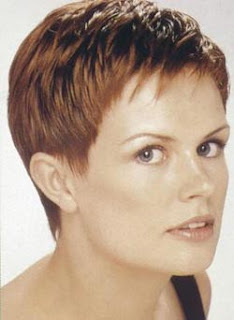 I remember back when everyone wanted the Dorothy Hamil short wedge hair style. I went and got that exact hair cut and I totally hated it. I had always had long hair and the short hair just didn't feel or look right to me. You can avoid this sort of disaster by trying it on first. Here are a few hairstyles demos to try out.